Home purchase with a VA loan are surprisingly easy and a good deal. VA mortgages are some of the best deals around. Whether refinancing or buying a home, the rates and terms are hard to beat. 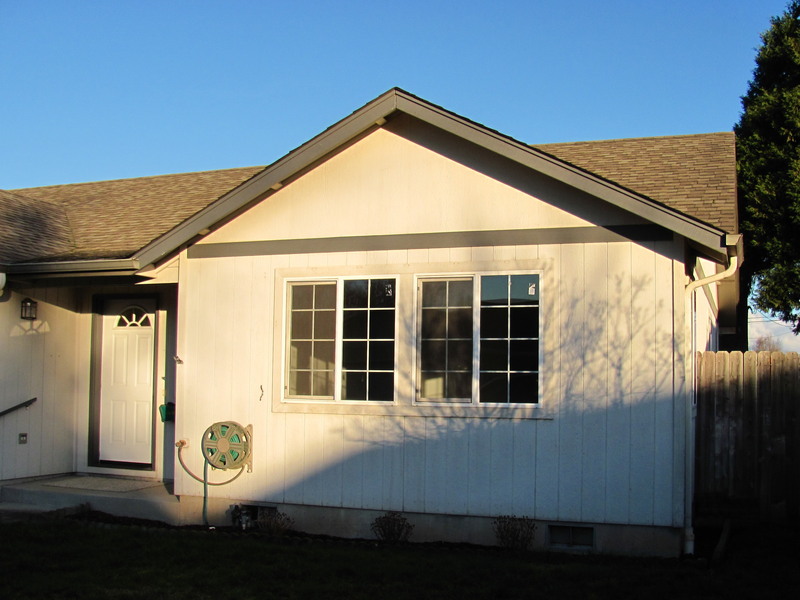 This cute home in Eugene Oregon is being purchased with a VA loan by a veteran, whom I’m working with as his Realtor, and interest rates are in the three percent range, which is cheap money in my book. As a general guideline, debt (PITI) costs around $5/1,000 at these rates, so a 100K loan is around $500/month, as a budgetary figure. What’s the catch? Well, you need to be a veteran, and meet some requirements. But, if you qualify for a VA loan, and if you can find a Realtor and lender that are familiar with VA purchases and mortgages, it’s remarkably simple for the home buyer. What are the requirements for eligibility for Federal VA loans? The VA determines your eligibility. Because it’s the Gov involved, as you might imagine, there’s a fair amount of paperwork and acronyms, however you’ve probably endured worse. The starting point is your DD 214, the Certificate of Release or Discharge from Active Duty. You can apply for your DD214 electronically or on paper using SF 180. The DD214 is used as documentation for your COE, Certificate of Eligibility. Your lender may be able to check your COE on line, with results generated in real time. You can also apply for your COE using form 26-1880. Get your COE and you’re golden, so to speak. Meaning your lender can issue you a prequalification or preapproval letter and you’re ready to start shopping for a house. Service between 1940 and 1980: active duty service 90 days wartime or 180 days peacetime. Service after September 7, 1980: generally requires 2 years active duty. National Guard or Reserves: 6 years guard/reserve service . Widower or Widow: If your spouse died on active duty or as a result from a service connected cause. You need to be unmarried, unless you’re 57 or older. If you were discharged other than honorably, further work-up by the VA will probably be needed. This is not an exhaustive list of VA loan eligibility requirements, but is a general guideline. The VA determines loan eligibility. The Federal VA guarantees the loan but a bank actually issues the loan. Depending on your level of benefits, the VA guarantees the loan up to 25% of the loan amount. Currently the maximum guarantee is $104,250 for a maximum loan amount of $417,000. It is possible for loans greater than this amount, but they may require down payment of 25% of the amount over $417,000. Loans under $417,000 generally do not require a down payment. The ODVA, Oregon Department of Veterans Affairs, is an actual lender to veterans for home purchases, in distinction to the Federal VA, which merely guarantees the loans. ODVA doesn’t charge a funding fee, but does require mortgage insurance if the LTV (loan to value ratio) is greater than 80%. Federal VA home loans do usually require a funding fee but don’t usually require mortgage insurance. ODVA has their own underwriters who may be willing to loan if your credit is below 620. Both ODVA and the Federal VA home loans are great programs, and which one to go through is best left to you and your banker. Your credit usually has to be 620 or above. The Federal VA per se has no credit requirement, but the secondary market, to which loans are sold, does. It still may be possible to get a VA guaranteed loan if your credit is lower than 620, but these are case by case, and your lender will have the most information on that. Usually, the Federal VA charges a funding fee, often quoted at 2.15% of the loan amount. The 2.15% is actually for first time use with zero down payment. The funding fee on subsequent use rises to 3.3% on zero down payment. With 5% down payment, the funding fee drops to 1.5% and with 10% down, the fee is currently at 1.25%. (Guard members not otherwise qualifying generally pay 0.25% more.) The funding fee is typically rolled into the loan. However, if you receive or are eligible to receive payments for a service related disability, this fee is usually waived. You’ll need form 26-8937 for this. The amount you are disabled (%) doesn’t matter–the fees are waived. Closing costs are NOT covered by your VA loan. However, you and your Realtor may be able to build them into the offer and have the seller pay for them. For instance, if closing costs were $1,000 on a house priced at $100K, you might offer $97K with seller to contribute 1K in buyer closing costs, prepaids and fees. Seller contributions to closing costs (concessions) are limited to 4% or less of the purchase price. Usually VA buyers have to come up with little or no out of pocket cash to buy a house. You will typically need a job, 2 or more years in duration, or other source of income to be eligible for a VA loan. Disability payments usually qualify for this. Unlike other loans, the VA looks more at residual income than DTI (debt to income ratio). Residual income is what’s left after the bills are paid, including utilities, on a sliding scale, based on the number of people in the household. High debt ratios (DTI) don’t automatically disqualify you from federal VA loans. For income to be counted, it must be acceptable (legal) in all 50 states. For instance, even though marijuana is legal in some states, including our neighbor to the north, it’s not legal in all states, so can’t be counted towards income. sizable down payment. 5% is considered sizable. Q: Can I use my federal VA loan for a manufactured or mobile home? A: Yes, if it is de-titled (not personal property), on its own permanent foundation, and on its own land. Q: Will a mobile home in a park qualify? A: Minimum requirements are the mobile home to be on it’s on its own land, so if you were renting a park space, the answer would be no. If you own the lot in the park, the answer is, yes, it should. Q: Can a pre-HUD mobile home (prior to June 15, 1976) qualify for a VA loan? A: I don’t think so. Minimum VA requirements tend to mirror HUD standards, and it would not be FHA/HUD financeable. Q: Will a single wide mobile home qualify for a VA loan? A: It may be difficult to find a lender that can write the loan, but as I read statute 36.4207, the answer is yes if it’s at least 10′ x 40′. Q: Does a mobile home need tie downs to qualify? A: The conventional thinking is yes. Q: Can I use my VA Benefits for a condo loan? A: Yes, if it’s greater than 400 square feet, and it’s a VA approved project . Q: Will I need insurance for my condo even though the project has casualty insurance? A: Yes. You will probably need a “walls-in” policy. Many, if not all, types of loans require a “walls-in” policy on condos, so this isn’t unique to the VA.
Q: Can I use my VA benefits to buy a single family rental house? A: No. VA loans are only for use in financing your primary residence. Q: After I’ve lived in the house a year, can I use it as a rental? A: Yes. You will need to sign a document saying you will use the house as your principle residence for one year. Q: How about a duplex, triplex or four-plex? A: If you are going to live in one of the units, then yes they should be VA eligible. If you are not going to count the rental income as part of your loan, you might even be eligible for zero down payment. Q: Are there standards a house must meet to be eligible for a VA loan? A: Yes. Dwellings must meet Minimum Property Requirements, generally similar to HUD standards. Your Realtor or lender should know the standards. Dry rot, wood-ground contact and bare wood are typically problems that must be fixed. Q: Can my spouse co-sign for the loan? Q: Is a termite inspection required? A: Not in Oregon, but they are still a good idea. States with a moderate to severe termite infestation probability (TIP), all but the northern most states, do require a termite inspection. If the appraisal comes back with evidence of pests or dryrot, an inspection will be required. Q: Will a special appraisal be needed? A: Yes. VA requires an appraisal from a VA Certified appraiser. The appraiser will follow guidelines and requirements acceptable to the VA.
Q: Who pays for the appraisal? A: Usually the borrower. There are certain circumstances in which the borrower is not allowed to pay for an appraiser, such as when a lender orders a second appraisal to challenge value. Q: Is an appraisal required for a VA refinance? A: Not if the existing loan is VA. If you are a veteran and thinking of buying a home in Lane County Oregon, I’d be pleased to assist you. Feel free to contact me. This entry was posted in Eugene Realty Listings, Loans/Financing/Credit and tagged odva home mortgage, va home mortgage, va loan eugene oregon, va loan springfield oregon. Bookmark the permalink.